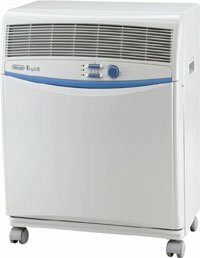 Water-to-Air Portable Air Conditioner with 10,000 BTUs and built-in 50 pint dehumidifier. Pinguino is the only portable air conditioner with 3M Filtrete electrostatic anti-bacterial filtration. This technology removes 99.97% of airborne particles without reducing airflow, optimizing air quality and circulation while extending the life of the unit. And it never needs cleaning just replace once a year.